Do you have scores or even hundreds of photos squirreled away on various drives? And just how many of them are duplicates or near duplicates? Bolidesoft's Image Comparer ($35 for home use; 30-day free, featured-limited demo) is a simple program that helps you sort through multiple instances of the same picture, select the best, or discard extra copies. 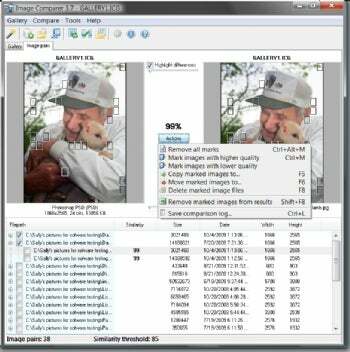 Image Comparer can sort through large numbers of photos in various folders, to help you manage duplicate or similar images. Note: The full functionality of Image Comparer is not available in the Trial version. Specifically, you can't copy, move or delete found duplicates. This program is available in two licenses, Home ($35) and Business ($50).